DMAI Names Visit Fairfax Sales Manager as Future Leader | "30 Under 30"
FAIRFAX COUNTY, VA – June 27, 2016 – Destination Marketing Association International (DMAI) has selected Melissa McClure of Visit Fairfax for its renowned “30 Under 30” program. The program focuses on identifying and developing the talent of destination marketing professionals, 30 years of age and under, through increased access and exposure to industry networking and thought leadership. 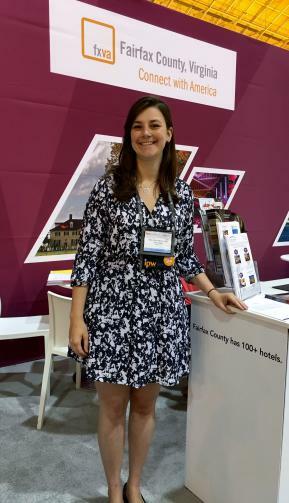 A lifelong resident of Fairfax County with a passion for travel, Melissa McClure joined Visit Fairfax as Destination Sales Manager, Domestic/International Packaged Tours, in early 2015. In just a year and a half, she has worked tirelessly to put Fairfax County on the map in many target markets around the world. Others have taken notice, as she was asked to join the board of National Travel Association’s Young Professionals Advisory Committee – and was named Chair just five months later. She is also currently enrolled in American Bus Association’s Certified Travel Industry Specialist program, which she will complete by January 2017. The 2016 honorees originate from a variety of destinations and backgrounds, from National Tourism Bureaus such as Brand USA and the Bermuda Tourism Authority to local Convention and Visitors Bureaus of counties and cities from around the United States. Now in its sixth year, “30 Under 30” is supported by founding program partner SearchWide, and sponsored by IMEX and USAE. The honorees will convene for the first time at DMAI’s Annual Convention August 1-3 in Minneapolis, MN. Recipients will be recognized Monday, August 1 immediately following the Opening Keynote featuring Abigail Posner.